topmost mordent | Wheat, Not Oats, Dear. Last night–as happens every night–long before my cell phone alarm clock was due to bury its wake-up call in my ears like a pole-axe, I woke up. The reasons for this generally differ. Sometimes the people across the way have inexplicably switched their Klieg-level upstairs light on at 2:47 a.m; sometimes a Loud Scary Noise has taken place, and I must spend some time convincing myself that an Amorphous Scary Monster intent on nothing good is not in my living room, thinking, “Ought I to eat these throw pillows? Wait, I eat people! Better go into that bedroom, where that person is! Ha ha!” Most of the time, however, my reasons for waking are meaningless. I’ve come to accept that I wake up, no matter what, be the conditions for sleep as still and felicitous as the Mississippi River on a warm summer’s night. Or something. But: When I walked to work this morning, and rounded the corner at Chestnut Street, I saw that the lilac bushes outside my building had finally, finally bloomed. This lilac-blooming is one of my favorite parts of spring, and I did not believe that it would occur this year. I had waited for so long for them, the lilacs, and they never came. It is too bad that a day like today–a day where the wind is so ireful and ceaseless that I would punch it in the mouth if it possessed a conscious self–ushered them into my life, but I’ll take it. I would have stopped to smell them for lots and lots longer, but metaphors were dropping out of the sky around me like anvils and I had to get indoors double-time. I went to the Harold Washington Library on Saturday for the first time in a loooo-ooooo-oooong time, and it was an adventure, all right! An adventure regarding which I’ll spare you the details. Mainly, I had forgotten just how much I love it there, and how silly it was that I’d stayed away for the length of time that I had. I was literally joyous on a cellular level. O the books! O the faint smell of Honey Nut Cheerios, which never quite dissipates [go there and breathe of the air in the literature stacks, and just try to defy me on this point]. Go to the library. You will be happy. 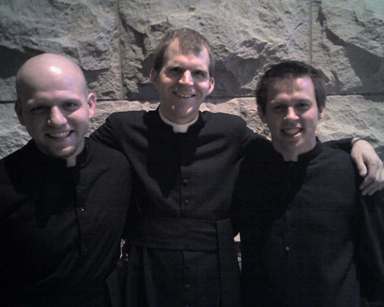 Recently–a few months ago, now?–one of my brothers, Andrew, announced his intention to enter the priesthood; this brings the percentage of my brothers who intend to become priests up to 50%. We are all happy as very happy clams for Andy and Ben, who will both be top-shelf men of the cloth. This weekend Andy “got back in the saddle”, as my mein mama put it, and served a Mass with Benjamin. 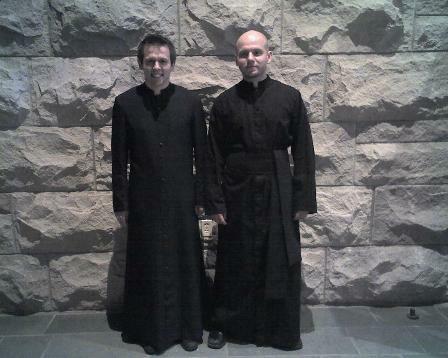 My father sent me pictures on my telephone after the fact, featuring them in their long black cassocks. Ben on the left, Angebo on the right. I told my mother, when I saw this picture–well, never you mind what I told my mother, except that it involves the words “Andrew”, “looks like” and “assassin”. This is a really great James Merrill poem that I’ve loved for ages, with terrific imagery and the word “belladonna”. Why throw it up today? Who knows? The wind knows. Oh Lord, it’s windy! I mean, my hair looks like I rolled around in an invisible tar pit.